2:51 I'm done for the day and for 2 weeks. No clinic next week. Have a great weekend. Take a course. asking how long the wait is, then being told it is 6 hours. 2:16 getting a dip passing the Uranus U180 timeline. 2:07 I am long one from 1096, and one from 1101, average 1098.5. My stop is a gainer, so I can afford to wait. This is critical when trading multiple contracts, because if a trade fails, it can really cost you. can trade one consistently well. 1:52 The common way of trading multiple contacts is something like Buy 3, take 1 off at 1 point, the second off at 2 points, and let one run. I don't do that. I make an early entry. If it works, I add again and sometimes a 3rd time. Then I hold them as a move runs, and cover all at once. 1:46 The Venus/Mars flux set the early high and the pulback low. The nex one up is about 1112.25, 75 ( 5x15) harmonic points up frm the low earlier this week. the V 0,M 315, H 315 timeline cluster. This energy may hold prices up until the close. 1:02 stop to 1096, break event. Just being patient. 12:52 on the MTRainbow chart, the EXMA's have curled up. Bullish for today. http://moneytide.com -> Courses for details. 12:14 if you have your sound card on and have not blocked autoplay of sounds in your browser, you heard a "duck call". This is an alert that my hex pattern recognizer has found a hex pattern at 1098. See Hex Wheels Today, right side of the List of Charts page. Also, for an explanation, read the page Hex Wheels 12:05 we are about to pick up a Green Swan cycle-the up version of my proprietary Black Swan cycle. This cycle laces through markets. Some times it catches price and takes it with it, sometimes it does not. 10:30 looks like following red -Tide right now. I want to see how we come out of this Tide time. 10:18 If this is a new fractal, there will be plenty of time to find a setup. Knowing how fractals develope is key to trading chaotic markets. 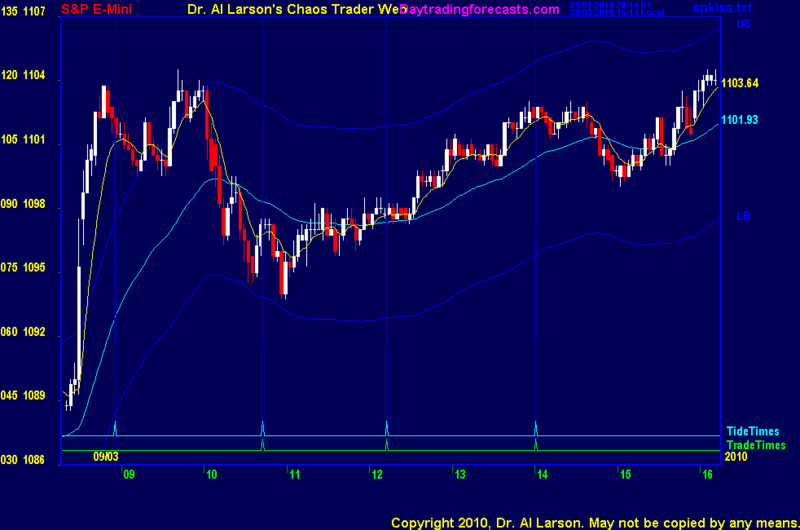 My key tool for that is the Fractal of Pi eMylar overlay. 10:15 on the MTRainbow chart it looks like we have the start of a new down fractal. Apparently it was "sell the news." 10:06 watching the astro stuff is hard-you cannot really watch it and trade without a lot of experience and knowledge. Your brain takes too long to processes all the information. For trades, watching a simple chart is much easier. See the page Keep It Simple on the right hand side of the ListOfCharts page. of price and time says a price move will take an equal amount of time to be absorbed. "Equal" requires a scale factor. One that works for intraday ES/SP is 3 points/hour. So this 15 point jump should take about 5 hours to be absorbed. Mars R+270/Venus V+270 flux. Pullback to the Moon T+000 flux is probable. Moon juice came from the T+000 timeline. 9/3/2010 11:42:46 AM MT Al****:: Sounds good to me. One can get a good HP laptop at Costco for under $800. 9/3/2010 11:34:56 AM MT EP:: I shall purchase a new computer, I look forward to taking your courses. 9/3/2010 10:36:49 AM MT EP:: AL is there a moneytide reader for MAC rather than windows?